The 2nd Generation EIS-PCB is being replaced by the faster, more powerful, enhanced 3rd Generation iServer "EIT-PCB". Please see the EIT-PCB for product details. The award-winning OMEGA™ i™Server is the simplest, easiest, most economical way for Original Equipment Manufacturers to network enable their products. 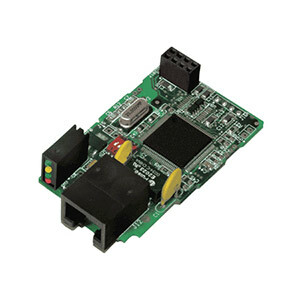 Any device with Serial Communications capability (RS-232, 422, or 485) can now connect to an Ethernet network and the Internet. The manufacturer's product will even be able to serve customized Active Web pages! The world's smallest World Wide Web Server, the OMEGA iServer-PCB is a printed circuit board, half the size of a business card, powered by 5 VDC from the product's main board. It connects the manufacturer's product to an Ethernet Network with a standard RJ45 connector. The OEM product can now become a node on an Ethernet network, or the Internet. The iServer is compatible with DHCP servers (Dynamic Host Configuration Protocol) and DNS servers (Domain Name System). This means that the OEM product can take a dynamically assigned IP address from a DHCP Server on a LAN or the Internet, and can be identified by name or IP address. This DHCP client capability is a valuable and unique feature of the OMEGA iServer that makes it extremely easy and simple for the manufacturer's customers to start using their product on almost any Ethernet network. The OEM or end users can easily assign a static IP address to the product instead of the dynamic IP address, if necessary. The IP address can be assigned locally with its serial connection, as well as remotely over an Ethernet network using Telnet or a Web browser. Users of these OEM products will be able to type the product's IP address or unique name in the address line of a Web Browser such as Internet Explorer. OMEGA offers custom firmware engineering services for each application to enable the OEM product to serve a Web page with a custom template and actively changing data. For example, an electric power meter could serve a Web page that displays whatever data is available from the meter such as current Kilowatts, accumulated Kilowatt Hours, Peak Rate, or any other information. A burglar alarm could serve a custom Web page that displayed current alarm status, log history, or anything else the alarm is capable of displaying. The OEM product can also be programmed to trigger an email or page to report an alarm or to update the current status. Alternatively, the iServer can be used to create a virtual tunnel on an Ethernet/Internet network simulating a local point-to-point serial connection between a manufacturer's device and a PC. This replaces dedicated point-to-point wiring limited to a few hundred feet. The OMEGA iServer packages the Serial data in standard TCP/IP packets that can travel anywhere on the Ethernet LAN or over the Internet. Using the embedded iServer, a manufacturer of time clocks will enable a payroll clerk to download data to a PC anywhere on a LAN or anywhere in the world. A manufacturer of process controllers would enable its customer to use a handheld computer with Wireless Ethernet connectivity to log data and change settings on the controller. OEM's do not need to rewrite the firmware for their serial devices to work with the iServer, and in some cases might not need to change their application software. The OEM's serial devices will function over the Ethernet network or the Internet as if they were connected directly to a PC. The COM port on the iServer simulates a local COM port on the PC.